Review: A fun thing happened in 2018, audiences finally got a genuine romantic comedy that broke new ground and did killer box office. That movie was Crazy Rich Asians and it restored some faith I had that Hollywood knew how to craft an old-fashioned yet modern romance and layered it with a decent amount of comedy. For a movie that was admittedly formulaic and strategically designed to press every button in the crowd-pleasing cortex of a movie-goers brain, it was remarkably well done and overwhelmingly entertaining. 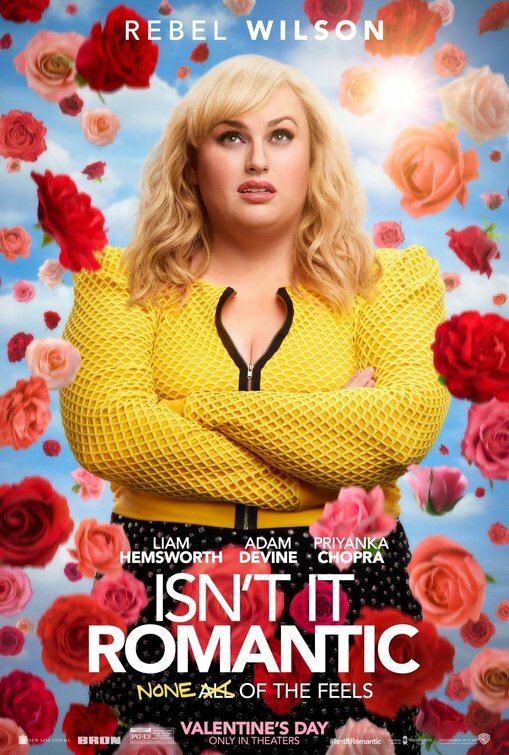 For Valentine’s Day 2019, Warner Brothers (the studio behind Crazy Rich Asians) has taken a gamble in gently spoofing its own good fortune with the release of Isn’t it Romantic. This light-as-a feather send-up of romantic comedies shouldn’t work as well as it does but it gets extra mileage from its leading lady and in an array of clichés the filmmakers turn from been-there-done-that rehashes into something that feels fresh. Mostly, it’s a movie that sets up a joke and then beats itself to the punch by lampooning it’s corniness before the audience has a chance to. Growing up, Natalie (Rebel Wilson, Pain & Gain) was always told the types of romance found in the movies are the stuff of fairy tales and would only happen to girls that are prettier and size zeros. Now living in a modest NYC apartment and holding down a job as an architect specializing in parking lots, she scoffs at her assistant’s (Betty Gilpin) passion for cheesy love stories while missing the obvious affection harbored by one of her coworkers (Adam DeVine, The Intern). To Natalie, true love doesn’t come with a pop soundtrack, a perfect wardrobe, and a loft dwelling no true New York 9-to-5er could ever afford. When she bonks her head after an attempted mugging, she wakes up in an alternate reality where all of those things become real. Everywhere she goes she hears a Vanessa Carlton song, when she leaves the hospital she returns home to a gigantic apartment and designer wardrobe, and her stoner next door neighbor (Brandon Scott Jones, Can You Ever Forgive Me?) has now become her gay best friend armed with sass and flare. At work things have changed as well. While the love from her coworker remains unrequited, her assistant has transformed into a severe alpha female that’s become her competition instead of her support system. Director Todd-Strauss-Schulson and the three credited female screenwriters have front-loaded the film with all the plot points that will come into play over the next brisk hour and a half. You can count on any sappy rom-com trope Natalie rolls her eyes at pre-head injury to come true when she’s living her new life, down to her hunky client (Liam Hemsworth, The Dressmaker) falling for her while she starts to have feelings for her office mate. It may be too late, though, as the friend-zoned guy has caught the eye of a beautiful yoga ambassador (Priyanka Chopra) who is fast-tracking their relationship. With several engaging musical sequences interspersed and a cast that has come to play, it’s more than sporadically funny but undeniably a bit hollow when all is said and done. I appreciated that Wilson is honing in on what makes her comedy so appealing and is distancing herself from the bumbling mess she normally leans into. The role gives her opportunities to play physical comedy and capitalize on her charm, she’s a leading lady it’s easy to root for. There’s also nice work from Jones as a dreadfully stereotypical character that puts all that on hold for a heart-to-heart with Wilson in a sweet scene. DeVine is less offensively stupid than usual and Hemsworth and Chopra bite down hard on their roles as prime examples of perfect specimens. Isn’t it Romantic plays it fairly loose much of the time, picking up threads and dropping them at will. There are plot gaps big enough to drive a flower truck of roses through but I’m guessing it’s not going to be that much of an issue for audiences that have come to have fun. The critic in me that loves follow-through would have liked to see more of Gilpin’s wicked side but I have a feeling much of her role was left on the cutting room floor in favor of keeping the film moving into another sprightly sequence of mirth. I also think there were some missed opportunities to directly send-up some notorious rom-coms that would have made the film feel a bit more meta. Still, this is engineered as a perfect date film or a movie the gals can all see together and taken on those merits it succeeds in its mission. Synopsis: It’s been five years since everything was awesome and the citizens are facing a huge new threat: LEGO DUPLO® invaders from outer space, wrecking everything faster than they can rebuild. Review: Admittedly, I wasn’t the biggest champion of 2014’s The LEGO® Movie and I fully recognize I was certainly in the minority. In fact, while many were gnashing their teeth when the film failed the land an Oscar nomination for Best Animated Feature I was silently in my own little corner doing a small victory dance. It’s not that I didn’t appreciate the film for its creativity but it was largely an obnoxious exercise of meta self-referential humor that took a misguided turn in its last act by bringing in a live-action subplot that failed to connect. Re-watching the film before heading out for the sequel screening only confirmed my original feelings that the movie was a colorful lark struggling to be more than the sum of its one-joke parts. With the overall success of the original film and two other LEGO follow-ups released in 2017, The LEGO® Batman Movie (which I quite enjoyed) and The LEGO® Ninjago Movie (the one I haven’t seen), it was only a matter of time before Warner Brothers reassembled the players for a second outing and they’ve largely delivered more of the same. So fans of the original should be pleased while those that didn’t necessarily fall out of their seats for the first helping won’t find anything here to convert them. 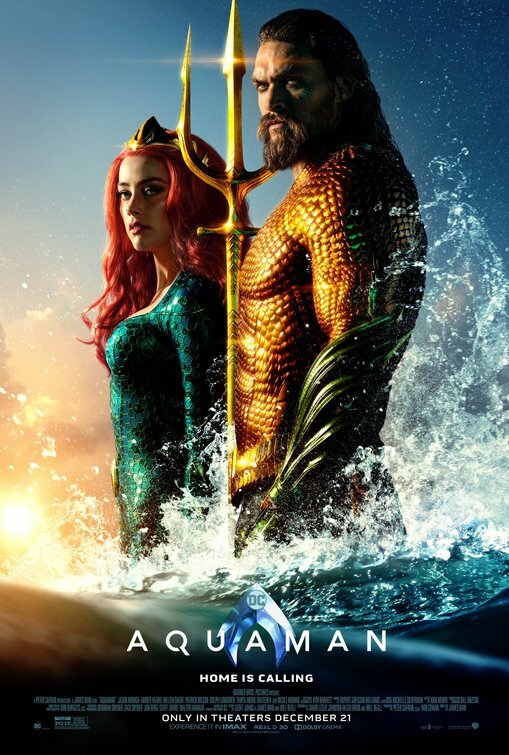 Sadly, the weakest element of the first film (the live-action scenes) is the one thing the filmmakers decided to expand upon here, creating an even greater disconnect between the action and the audience. 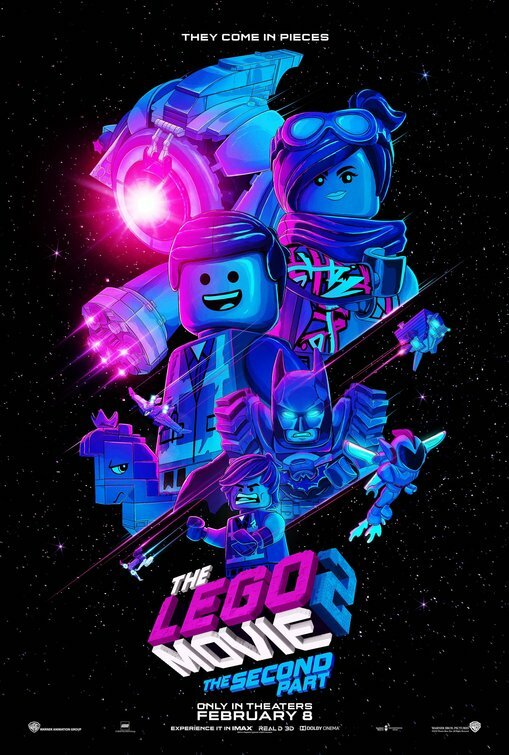 Nicely connecting with the original by picking up in the last few moments of the first film, the sequel introduces our heroes to an alien race (Duplo blocks) that sets about destroying the world they had just saved from the evil President Business (Will Ferrell, Daddy’s Home). Five years later, Emmet (Chris Pratt, Jurassic World). Lucy (Elizabeth Banks, People Like Us) and their friends have built Apocalypseburg out of the ruins of what was once their thriving community of Bricksburg. Even in the face of a life considerably less awesome, Emmet is resolutely positive, much to the frustration of his more grounded life partner Lucy. Wanting a life of peace and harmony, Emmet even builds a quaint suburban style house for Lucy in the midst of the ruins they now call home. The first film saved the live-action reveal for the very end, showing the world we’d been watching was merely a playground for a young boy playing with his dad’s LEGO blocks. It didn’t make much sense then and it doesn’t make a lot more sense in the sequel that finds the boy and his sister having a turf war over their toys, forcing their mom (Maya Rudolph, Life of the Party) to step in and lay down the law. It never is clear just how the animated action is directly related to this live-action business and every time we switched to the actors badly going through their dialogue the movie ground to an interminable halt. Even the normally dependable Rudolph can’t turn the dial on this to make it funnier. This is too bad because the film is once again beautifully animated and rendered with dazzling color and clarity. Far more musical than its predecessor (Haddish gets two songs of her own and the ear worm song, Everything is Awesome, comes back in several versions), the movie doesn’t break much new ground in terms of forwarding the story and it’s severely lacking the spark of invention that made the first film at least interesting. Now it’s just a good-looking movie with some fun nostalgia bits for seasoned movie-goers (you may need to see the movie twice to catch all of the references to other films) and a quaint message of self-acceptance Disney’s been making bank on for years. With a run time stretching past 90 minutes and the longest end credits I’ve ever sat through, this is one you’ll need to think carefully on if you want to devote time to in theaters. You’ll lose nothing by waiting to see this in the comfort of your own home. Review: With an abundance of celebrated feature films, made-for-TV movies, television series, and award-winning documentaries, I feel like I have a pretty well rounded knowledge of World War II. I’m not sure why, but it seems like that particular time in history has provided a wealth of opportunities to highlight the men and women that served their country and the horrors of the war they were fighting. I feel more than a little bit guilty in admitting I’m not nearly as familiar with the first World War; so, while I know the basics, it’s been some time since I’ve done any kind of deeper dive into it. 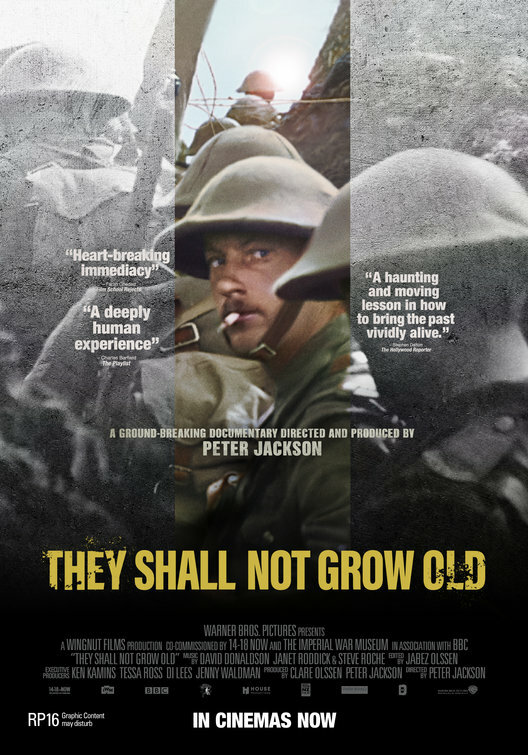 Spearheaded by Oscar-winning director Peter Jackson (The Hobbit: The Desolation of Smaug, The Frighteners) the new documentary They Shall Not Grow Old isn’t the first film to explore the hell of the battlefield of The First World War but it’s in the way it is delivered that sets it apart (and, in some cases, above) similarly themed films. Using archival video from the Imperial War Museum and oral histories gathered from British servicemen, Jackson has crafted a strikingly immediate film that puts audiences right into the trenches. With a personal connection to several of the soldiers that fought in the war, Jackson’s first documentary is (of course) a film that looks beautiful but also has a significant abundance of heart. When war breaks out in July of 1914, a once-idyllic façade in England cracks, thrusting men as young as 15 into service fighting for their country. Though the 120 interviewees speaking aren’t identified until the end credits, each have a story about how they came to sign up and ship out into a war zone from which they may never return. These early sequences showcase an England and a people that might have been lost forever without this valuable film stock. Seeing the faces of the enlisted men without a clue of what they were about to face is haunting. The black and white footage that accompanies these early sections of the film (including establishing shots of soldiers training for battle and traveling to the frontline) gives way to a goosebump inducing moment when Jackson colorizes the film. In transitioning to color, Jackson somehow makes things feel more “real” not just for the soldiers but for audiences as well. No shoddy colorization like you may have seen in old I Love Lucy episodes or that awful version of It’s a Wonderful Life, Jackson’s special effects team has painstakingly taken care in making wise choices in color and tone. It’s an astonishing effect and coupled with added sound effects, vocals, and a few tweaks to the film here and there, it helps the footage to feel brand new. Some showings of the film will also be in 3D and here is another example where I think the upgrade is worth it, adding that extra depth helped bring some of these amazing images even further into focus. If there’s one thing that keeps the movie from being an outright winner it’s a saggy middle that finds Jackson falling into repetition in certain stories and images. I know he didn’t have a lot of material to work with to illustrate specific moments that are described in interviews but there are some images and film footage that are used multiple times to represent several different incidents. These become distracting after a while and near the end there are events described that have no accompanying footage so they are paired with artist renderings instead. All in all, the film feels right on target when the stories being relayed in the voice-overs match up with the film footage (much of which has never been seen prior to this release) is being shown. While it shouldn’t substitute for some good old fashioned cracking opening of a book, They Shall Not Grow Old is quite a remarkable achievement as a historical documentary. Managing to deliver a unique holistic overview of The Great War using innovative technology and narration culled from interviews by those that lived through it, it’s a sobering experience that benefits from a viewing on a big screen. Review: Some movies feel like great equalizers, something we all can agree on even when we disagree on most everything else. For me, Beetlejuice is one of those movies. Even the hardest of hearts and the most unpleasant of critics are able to find something to praise in this loads of fun horror comedy first released in 1988. Now celebrating it’s 30th Anniversary (and with a musical stage adaptation headed for Broadway in 2019), it’s a great time to revisit ‘the ghost with the most’ in all his ribald glory. Director Tim Burton cut his teeth with many darkly comic shorts in the early ‘80s, making his big screen debut with Pee Wee’s Big Adventure in 1985. Three years after that and one year before he’d officially be catapulted into the A-List with the summer smash, career-defining adaption of Batman, he gave us this endlessly creative and visually captivating flick. Though originally intended to be a much darker film (and almost starring Sammy Davis Jr. as the titular character) it was wisely steered in the direction of going for more laughs than shrieks. Sure, there are scary parts to Beetlejuice but with its focus on dynamite practical effects and ingenious make-up (which would win an Oscar) the majority of film wants to make your jaw drop in awe instead of in a scream. Adam and Barbara Maitland are just settling in to a two-week vacation at their home in postcard perfect Winter River, CT when they die in a car crash after careening off a picturesque covered bridge. They find themselves trapped on earth in their previous home with its new tenants, pretentious NYC transplants. 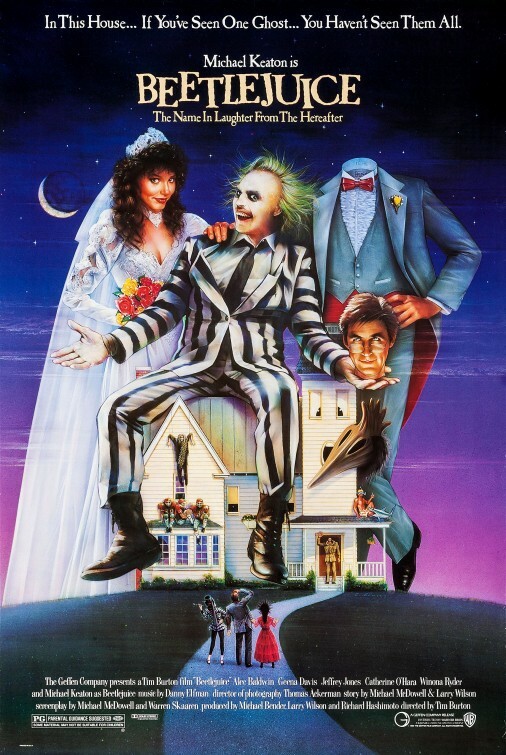 Though they try to get rid of the family first in their own newbie ghostly way, they eventually summon Beetlejuice, a bio-exorcist for the undead that has more effective ways of cleaning house. When Beetlejuice sets his sights on marrying the goth daughter of the owners, the Matilands take further action to evict the trouble-making exorcist. Though later on in his career Burton would use his actors more like scenery in service to his muddy CGI vision (yikes! Sweeney Todd!) here he has cast the film to absolute perfection. Alec Baldwin (Aloha) and Geena Davis (A League of Their Own) ably play the slightly square recently deceased couple who sees their house go from Norman Rockwell perfection to new wave mania. It’s fun to see Jeffrey Jones (Howard the Duck) and Catherine O’Hara (Frankenweenie) play off of each other’s small town discomfort in a Green Acres-sorta way. The film also nicely introduces Winona Ryder (Mermaids) to a larger audience with Ryder nailing her adolescent ambivalence toward most everything she comes in contact with. Even if he has the least screen time of any of the principal actors, when you hear the word Beetlejuice you can’t help but instantly think of Michael Keaton (Spotlight, Gung-Ho, Pacific Heights). Making the most out of his limited appearances, Keaton is a live wire with enough energy to practically lift him off of the ground. His make-up and costuming could have been limiting or in the hands of a lesser actor could have done the work for him but Keaton mines every opportunity to go big before he goes home. If the Oscars had been a bit more free-thinking, it’s the kind of memorable performance that should have put Keaton into the awards discussion as an outside of the box nominee for Best Supporting Actor. While Burton (Dark Shadows, Big Eyes) would go on to create they moody Batman and its sequel, he never has returned to this type of free-wheeling carnival of fun and that’s a damn shame. He clearly knows his way around this tone and finds a perfect balance throughout. When CGI became more available he started to rely on that way too much and all but abandoned the kind of in-camera effects and large scale production design employed here. While his next film, Dumbo, looks like a heart-tugging triumph…all I can see is the overuse of CGI again. 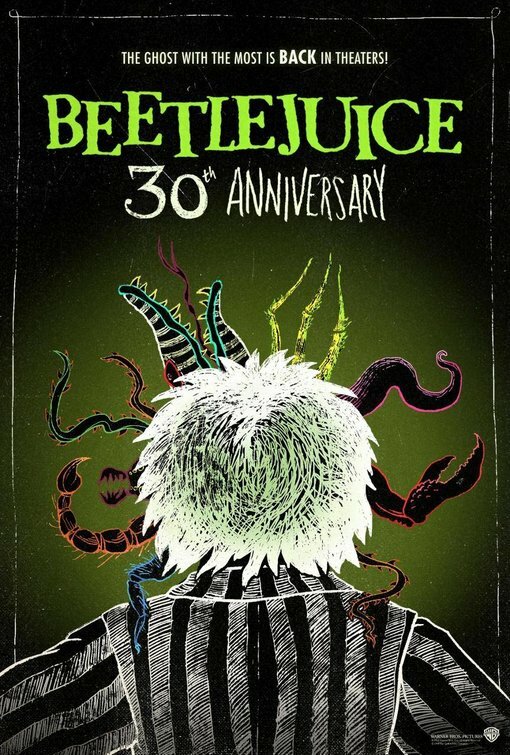 If anything, Beetlejuice remains a reminder of the kind of filmmaker Burton originally started out as and what I hope he’ll continue to work back toward being. This is one of the rare movies I manage to see at least once a year. I watched it on a plane back in January and then attended a 30th Anniversary Screening of it recently and I could easily see watching it again before the year is through. I’m seeing the musical in a month so I have a lot of Beetlejuice in my life right now…and so should you! 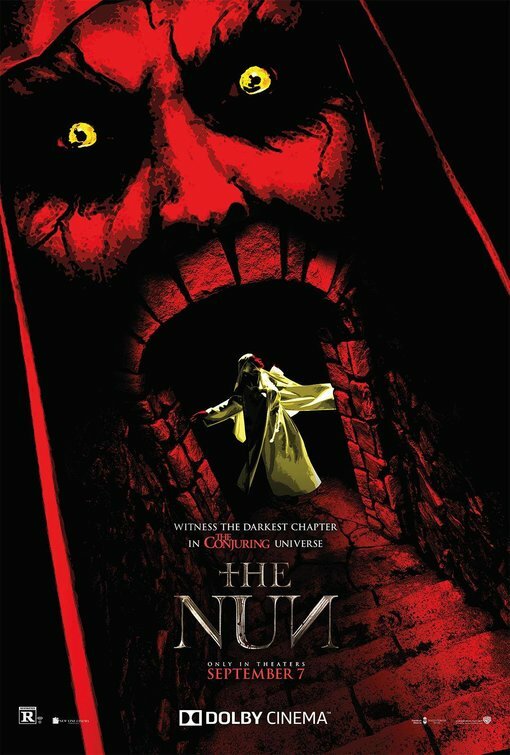 Synopsis: Ignoring the eerie warning of a troubled mother suspected of child endangerment, a social worker and her own small kids are soon drawn into a frightening supernatural realm. 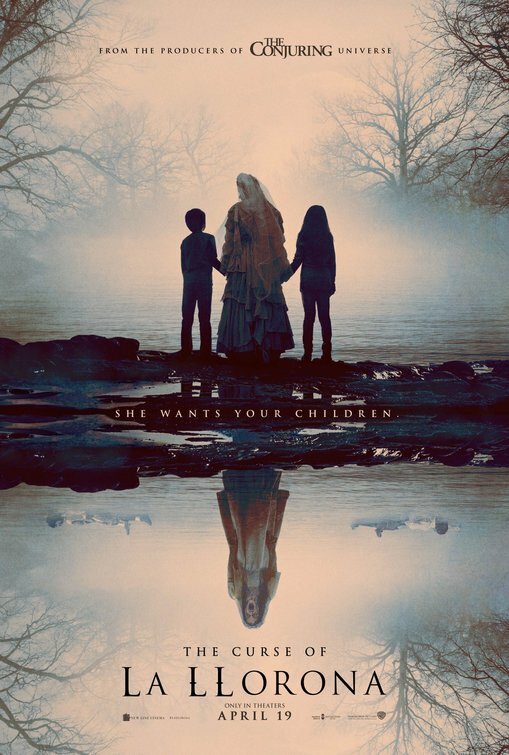 Thoughts: It appears that director James Wan is creating his own cottage industry (not to mention an expanding horror universe) in horror films like The Curse of La Llorona. 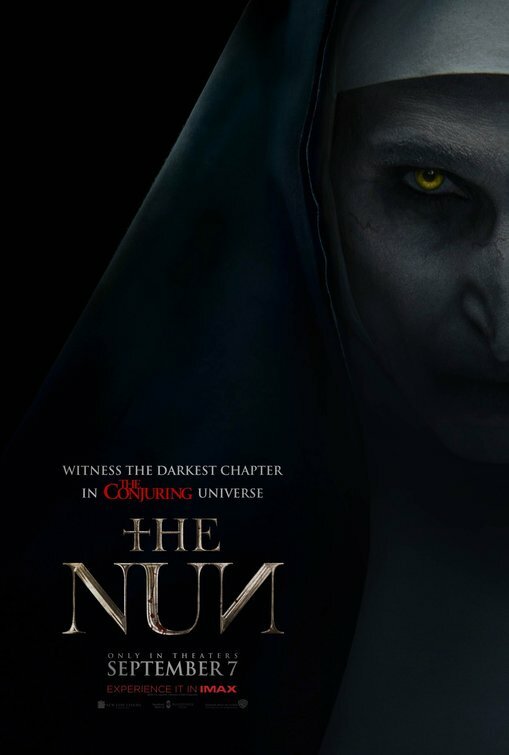 Wan was behind The Conjuring and all it’s various off shoots (most recently represented with the box office smash The Nun) which have been gigantically profitable even though they were made for very little. After going outside his neighborhood for Lights Out he returns with this spooky tale based on a story from Mexican folklore. This first teaser has some spiffy moments in it while not giving away so much (take a page from the Warner Brothers marketing team, Halloween) that further scares will be spoiled. 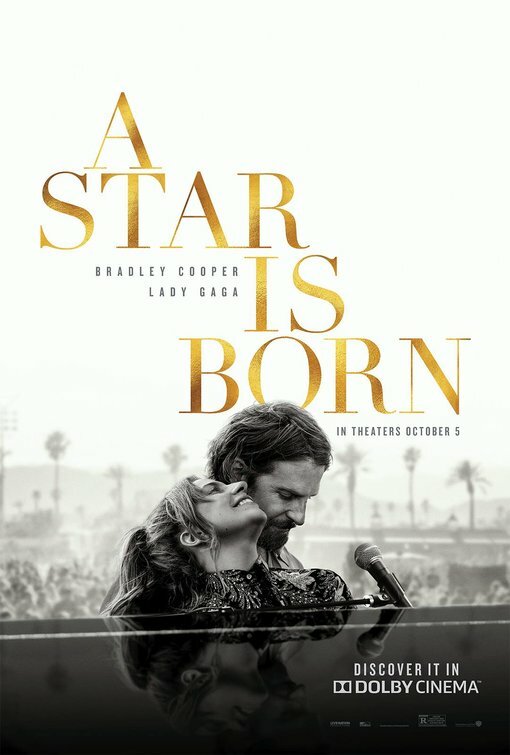 Review: If there’s one thing I can say about this fourth version of A Star is Born it is that you should most definitely believe the hype that has followed the film for the last several months as it has held private screenings and then debuted at the fall festivals. After laboring in development for nearly a decade and going through directors like Clint Eastwood and Steven Spielberg and rumored stars such as Will Smith and Beyoncé, the stars have aligned (literally) and produced a mega-watt 2018 version of this timeless tale of stardom. I think we can all thank our fair godmothers Eastwood didn’t find his way behind the camera. As much respect as I have for him as a director, his films over the last few years have gotten stodgy and square which is the exact opposite tone of what was needed to bring this story into a new era. Instead we have Eastwood adjacent Oscar-nominated Bradley Cooper in the director’s chair and he’s definitely taking a confident page from his American Sniper colleague in moving from the actor period of his career into the actor-director phase. The last time A Star is Born was seen onscreen was a whopping 42 years ago in Barbra Streisand and Kris Kristofferson’s ill-advised update which moved the action from Hollywood to the rock-and-roll music scene of the late ‘70s. That version was sunk by a lead actress that wasn’t right for the character, a leading man that wilted in the presence of his co-star, a script that stunk, and a director that couldn’t salvage it. Plain and simple, it was a blight on the 1937 and 1954 versions and while it was the third highest grossing film of 1976 it’s considered by many to be the least enjoyable of the triptych. It’s no small miracle, then, that Cooper and fellow screenwriters Eric Roth (Forrest Gump and Wolfen) and Will Fetters (The Lucky One) managed to keep the music setting of the 1976 version but brought back the magic and music of the 1954 version along with the tragedy of the 1937 original. Here’s the best cinematic take on the material, a handsome film that runs too long but has such a dynamic duo at its center that audiences will easily forgive sitting in their seats 15 minutes longer than necessary. Though decades have passed, the story of A Star is Born remains the same: A young upstart is guided to fame by a man whose own career is nearing the end. Aging country singer Jackson Maine (Cooper, Silver Linings Playbook) is a hard-drinker that’s losing his hearing. Though not struggling to stay relevant as previous iterations of this character, he’s in a certain holding pattern in his career where he can see the writing on the wall. Desperate for another drink and not wanting to go back to his hotel, he has his driver drop him at the nearest bar…and it happens to be a drag club that Ally (Lady Gaga) is performing in. Her performance and presence captivate him and they spend a night discussing his life, her plans, and everything in between. 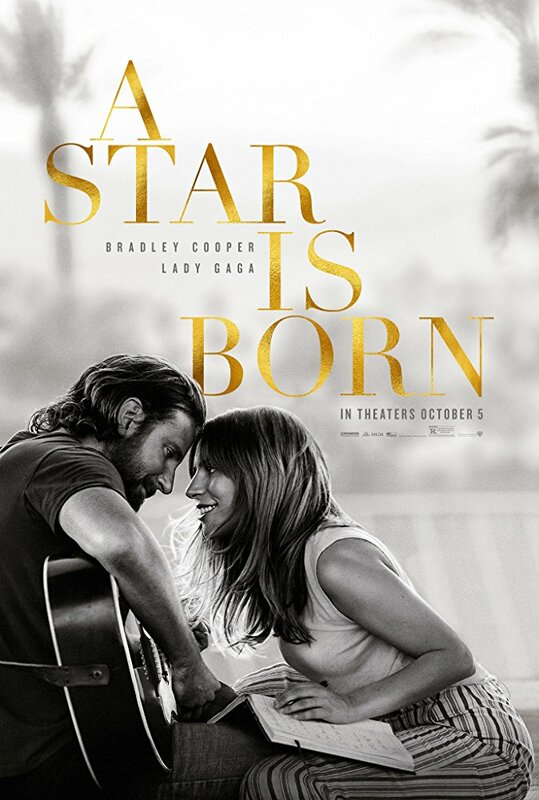 The first hour of A Star is Born is devoted to Jackson and Ally’s burgeoning relationship as he whisks her away from her job and family (dad is played by Andrew Dice Clay, Blue Jasmine) to constantly be by his side. Jackson’s creativity is reenergized by Ally’s talent and by the time he brings her onstage for a duet of the song they co-wrote on the fly the film is positively bursting at the seams to have audiences stand up and cheer. Much like Judy Garland’s performance of The Man that Got Away early on in the 1954 version, the rest of the film can’t quite match that jolt of lightening moment, even though Cooper and Gaga fill the remaining time with memorable music and scenes that highlight the rocky road to fame and the dramatic fall of losing it all. All pervious takes on A Star is Born have placed the female lead as the heart and soul of the picture but, and this is no slight on Lady Gaga who more than holds her own in the acting department, Cooper walks away with the movie. His greasy hair, grizzled features, and gravely voice instantly give you the entire story of years of rough living and his weary eyes tell of a man with a soul that is winding down. Meeting Ally and falling in love saves him from falling over the edge but is her love and care enough to keep him on steady ground? Cooper digs deep here and by the time the film reaches it’s four-hanky finale with the most startling ending yet, your heart more than aches for him. As mentioned above, any fears that Lady Gaga wouldn’t be up for the challenge vanish almost the moment she appears onscreen. Though she does her best work while signing (as someone who has attended four of her concerts I can tell you she gives 150% every time and that’s the same here) Cooper coaxes far more nuance out of her than most people will realize. The chemistry between the two is off the charts and you can expect both actors to be showered with awards and/or nominations at the end of the year. Another person to mention is Sam Elliott (I’ll See You in My Dreams, Grandma) as Cooper’s manager/big brother who has had to play father and sober cab nursemaid to his sibling while foregoing his own dreams and aspirations. Elliott has always been a strong presence in films but he’s given some pretty special scenes here that allow him to stretch further than he’s gone in quite some time. It helps that Cooper matches Elliott’s bottom basement growl; I had no trouble believing these were brothers with a fraught history. The first half of the movie is so good and well paced that the numerous leaps in time that fill the second half are a bit jarring. Focused on Ally’s rise to fame as a pop music star (hosting Saturday Night Live, being nominated for a Grammy, etc) the film hops around quite a bit and leaves some storytelling elements in the dust. That’s also when Lady Gaga is at her weakest as her musical performances feel a bit restrained and overproduced. Anytime the two leads are alone on screen, however, brings the movie back to solid ground and by the time we reach the end we’re on the edge of our seats even if we already know how it’s going to end. It’s easy to see why this garnered such hugely positive buzz months before it was released. It’s been finished for some time and waiting for it’s October release date. In the meantime, Cooper isn’t a dummy and wisely showed it to several big names in Hollywood (including Streisand) who have been effusive in their praise of the film. When it rolled out to critics they too were taken by the prestige of the picture and by the time the general public gets their eyes on it this weekend I’m certain even more good notices will come their way. It’s going to go even further with strong word-of-mouth and, I’m guessing, repeat business. I’m already finding time in my schedule to see it again. Thoughts: A third remake of 1937’s A Star is Born has been in the works for a while. It was long thought Clint Eastwood would direct Beyoncé and Will Smith in the story of a fading rock icon mentoring and falling for a star on the rise but the A-listers couldn’t align their schedules and Eastwood lost interest. Cut to Oscar nominee Bradley Cooper (American Hustle) directing his first feature and snagging Lady Gaga, one of pop music’s most prominent celebrities, to costar alongside him. It’s a well known secret many people in Hollywood have already seen this – the notoriously fame-averse Sean Penn says its one of the best films he’s seen and calls Gaga “a miracle.” While Gaga earned a Golden Globe for her work on American Horror Story: Hotel her acting, well, didn’t quite sing in my book. After catching this first look at her work here, could Gaga be on the Cher route to Oscar gold?